It is the first research facility on campus to be constructed with a geothermal heating and cooling system. Once the facility opens in fall 2010, the unseen holes sunk deep below the earth’s surface will provide an annual 10 percent savings on energy use. More than two-thirds of the funding for the facility under construction on the triangle of land between Campus Drive and the 1300 block of University Avenue comes from private gifts from UW-Madison alumni John and Tashia Morgridge and the Wisconsin Alumni Research Foundation. The cost of the underground geothermal system, expected to function for at least 50 years, totals $1.25 million. The deep drilling will be completed by the end of 2009, when the facility housing the private Morgridge Institute for Research and the university’s public Wisconsin Institute for Discovery will qualify for a coveted Leadership in Energy and Environmental Design (LEED) certification. “The decision to include a geothermal system in the facility design reflects one of the core principles of this project — a commitment to using best practices for sustainable development,” says George Austin, building project manager for the Wisconsin Institutes for Discovery. Project engineers expect the geothermal system, designed by Affiliated Engineers of Madison, to provide approximately 300 tons of cooling and heating. This capacity can be used continuously for either heating or cooling the building directly, or for optimizing the building’s use of the UW-Madison campus district utilities. “Geothermal systems provide heating and cooling for buildings by using the mass and relatively constant temperatures of the earth as either a heat sink or source,” says Austin. 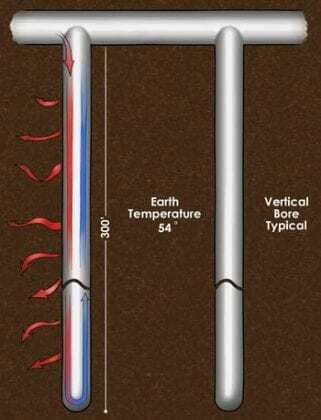 Subsurface conditions determine the effectiveness of a geothermal system. Diagram of a typical bore hole for the WID site. With its placement between two lakes, Austin says, the site of the Wisconsin Institutes for Discovery, as well as Madison in general, is ideal for this type of sustainable energy system. “With both the prevalence and movement of below ground water, the Wisconsin Institutes for Discovery site possesses exceptional subsurface conductivity for a geothermal system,” he says. Each bore serves as a “heat exchanger” to allow the transfer of heat to or from the earth when cooling or heating the building respectively. This heat exchanger is coupled to the building mechanical systems through a heat pump chiller, which uses electrically powered compressor technology to balance a portion of the building’s internal load. The heat exchanger uses the geothermal heat sink to make up the difference between the building’s internal heat gain and load. In other words, the system reuses the heat that is not needed in one part of the building and distributes it where needed in other parts of the building. An architectural design specifically intended to facilitate interactions and collaboration between the resident researchers. Easily changeable research laboratories built to accommodate a wide range of research activities and to allow for quick conversion of lab space for uses ranging from synthetic chemistry to developmental biology to computer science. This feature is intended to allow, within the facility itself, maximum collaboration between the various scientific disciplines. Housing within a single facility for a public research institute, the Wisconsin Institute for Discovery that is part of the Graduate School and a private, not-for-profit research institute, the Morgridge Institute for Research. No public money will fund the portion of the facility housing the Morgridge Institute for Research. The addition of teaching laboratories on each research floor for use in introducing students of all ages to the excitement of scientific research. A first-floor public space named the Town Center. Like the rest of the building, this space is designed to accommodate a wide range of activities and will offer a restaurant, coffee shop and soda fountain, as well as space for meetings, symposia, education and quiet reflection. It is designed for researchers from across campus and the general public to mingle and share ideas. A commitment to “green” and sustainable building design and operation and a philosophical approach toward the facility and institutes as living experiments. In addition to this geothermal system being the first to be used in a research facility at UW-Madison (a residential system was installed during the recent reconstruction of Olin House, the official residence of the UW-Madison chancellor), this installation also demonstrates that such a system can be used effectively on a constricted urban site. The site of the Wisconsin Institutes for Discovery has a very narrow perimeter bordered by busy thoroughfares. The narrowness of the site made this project unique since regulations of the Wisconsin Department of Natural Resources restrict the construction of vertical borefields to the outside of a building’s footprint. The Wisconsin Institutes for Discovery is a unique public/private initiative designed under one roof to facilitate interdisciplinary research and breakthrough discoveries to improve human health. Made up of the private Morgridge Institute for Research and the public Wisconsin Institute for Discovery, the new facility will open during the fall of 2010.